Minutes Librarians will share 30 great titles in just 30 minutes. Timbeleza is a Brazilian percussion ensemble based out of Pittsburgh, PA that has been performing since 2005. Their goal is to expose people to samba as well as invigorate the community with music and performance. Gadget Lab Staff will demonstrate how to use the Library’s downloadable services with eReaders and MP3 players. 10 am – 6 pm on Friday; 9 am – 5 pm on Saturday; and 10 am – 4 pm on Sunday. For additional Library events at the Pittsburgh Public Market call 412.622.3114 or please visit www.carnegielibrary.org, www.pittsburghpublicmarket.org or www.neighborsinthestrip.com. Santa does his Holiday shopping in the Strip, and you can too. The Strip District merchants offer a wide variety of all sorts of, well stuff! Everything from ethnic foods to kitchenwares and unique gifts. And with the opening of the Pittsburgh Public Market, there are provenders of artisan made goods. Santa was so impressed with the Strip District on his visit earlier this month and he is coming back to finish up his own holiday shopping! You can check to see what Santa thinks are the hottest gifts from the Strip District or pass on your own Wish List to Santa. Bring your camera and get your photo with Santa too! Neighbors in the Strip has announced the completion of artists Carley Parrish and Shannon Pultz’s 2010 mural in the Strip District. 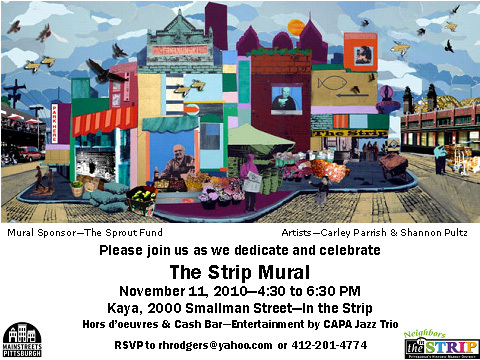 “The Strip Mural” was created in partnership with The Sprout Fund and members of the Strip District community to reflect the neighborhood’s vibrant culture and rich history. The mural, located at 1907 Penn Avenue, is one of the largest undertaken by The Sprout Public Art program. Carley is a Polish Hill resident and also did an arts program for kids at West Penn in the summer of 2009. She also teaches sculpture at CAPA High School. A dedication event for the mural will be held at the mural site on Thursday, November 11, beginning at 4:30 pm, immediately followed by a reception at the adjacent Kaya restaurant. Refreshments will be provided by Kaya and Papa J’s. Entertainment will be provided by the CAPA Jazz Band, and the public is welcome. "A New York Heartbeat" Prop Sale – You can own a piece of the movie! A little something from our friends at Neighbors in the Strip. Thanks, this sounds like it might be wonderful. For a special preview of the market, come down on Labor Day weekend, September 3, 4 and 5 to meet the vendors and shop till your heart’s content and then return on September 10, 11 and 12 for the Grand Opening Festivities which will provide fun for every member of the family. Keep watching the Pittsburgh Public Market Website and Facebook page for more information as the big day approaches. You’ll find over 40 vendors in the Public Market, some seasonal, but most year-round. You’ll find some old friends, and meet many new and exciting businesses to introduce you to new taste sensations and offer unique merchandise to spice up your life. Check the ever-growing list of vendors, you’re bound to find something you can’t live without. We’ll be introducing you to our vendors in the upcoming months, so check back often to learn more about this very special group. All of this sounds like a great addition to the city. I am looking forward to exploring what the Public Market will offer. Stay tuned for more information about everything from balloons to music to the best local foods in the ‘Burgh! The Pittsburgh Public Market will be opening Labor Day Weekend — September 3, 4, and 5. This new venture is a revitalization of an old idea: public markets were conceived as a place to sell frsh produce, and other goods. Pittsburgh’s last public market house was demolished in 1965 to make way for development on the North Side, greatly reducing the opportunities for local farmers and artisans to market their wares. There is some great historical information at the Pittsburgh Public Market site. A few years ago, Neighbors in the Strip began researching the viability of establishing a year-round public market. The result has been the renovation of the historic Produce Terminal building, located on Smallman Street in the Strip District. The vendors displaying their wares in this contemporary take on the public market ranges from specialty teas to Moroccan crafts. A list of vendors is available here. In addition to the opportunities to shop local produce and artisan-made wares, Pittsburgh Public Market plans to have programming for the community on-site at the market house. Join Us…JULY 31st for Strip Fest. Right By Nature & Cioppino’s bring you Music, Food & Fun including a BBQ Pig Roast, Beer Wagon Gig Rig, Live Music and product sampling, and as always, we have FREE parking! Also, they are looking for vendors to set up and sell their products during the event. For more info, contact Shona at shona@cioppinoofpittsburgh.com or 412-281-6593. News from our Neighbors in the Strip! Neighbors in the Strip’s egram tells you about all of the news and events happening in Pittsburgh’s Strip District. Stay up on what’s happening with NITS and the Strip…sign up for e-grams. This time, the fun and unique atmosphere at Wholey’s is now even more entertaining! Through August 10, 2010, Wholey’s is holding it’s first annual “Count the Trout” contest! The ever-popular fish tank at Wholey’s is brimming with rainbow trout, and you are invited to come down and take your best guess at how many are in there! It’s only $1 per chance, and 100% of the proceeds will be contributed to The Children’s Institute in Squirrel Hill. The person with the closest guess will receive a $200 Wholey’s gift card! Wholey’s is very excited to start this new tradition, so get down there and check it out – have some fun, learn some interesting facts about rainbow trout, and see how much money can be raise for The Children’s Institute! And, in case you didn’t know it, Wholey’s is open 7 days a week! This just in from our lovely friends at Neighbors in the Strip. Leaf and Bean is ramping up for Rocky Patel’s visit to the Strip. A large shipment of Rocky’s cigars is already in stock. Hustle on down to Leaf and Bean in the Strip from noon – 3:00 on Sunday, May 9 for a Block Party to greet Rocky. 22nd Street will be closed for the festivities and live music will be provided by Tom Breiding and Guests. Food vendors and Rocky Patel cigar specials will be featured. A free $38 Rocky Patel Lighter with lifetime guarantee goes to everyone who buys a box of his cigars (20+ cigars – you can mix and match). For two boxes, in addition to the lighter you also receive a Four-Foot Rocky Patel Wooden Cigar! And if that’s not enough, all box purchasers will also be eligible to receive a Grand Prize of a special box of Rocky Patel Limited “A’s”. Don’t think Mom will be interested? Leaf and Bean has worked out a special deal with Collage, directly across the street. Collage is offering a 20% discount to moms – all you have to do is show a Leaf and Bean business card (offer good May 9 only). So Mom can pick out whatever she wants, while dad relaxes with a fine cigar and some sweet music. Bring your lawn chair and camera for the biggest cigar event to take place in Pittsburgh! And if you want to know what is happening in the Strip District, you can sign up for the NITS E-Gram on their website.